There more double-digit winners tweeted @RayCotolo this week. Let’s start reviewing winners from that point. Chester, April 22: Beware Of Darkness, $21.40. Including what losers were tweeted, the five winners produced a profit if all horses tweeted were played. If you are not already, connect to Twitter and follow Frank and Ray Cotolo for late suggestions on plays. Then, wager from TwinSpires. Get onto our mailing list to learn how to get upcoming horses to watch by clicking here. 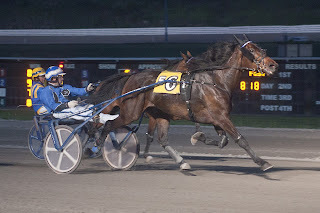 At Yonkers on Saturday night, we nailed the Matchmaker Final, defying the prohibitive favorite See You At Peelers with a win by Rocklamation. She paid $12 and See You At Peelers finished last, burned out from fast early fractions and a duel with Anndrovette. That is the scenario that we counted upon and this time we were right. We won the George Morton Levy Pacing Series Final with Razzle Dazzle, though when we chose him we did not expect the humungous support he would get from the public. The winner paid a mere $3.10. At Cal Expo, the favorites were soaring in the no-takeout Pick 4 on April 27, unless you used our single in leg two. RW Island Spirit turned out to be the favorite in Race 12, which we did not forecast, and he lost. A 2-1 shot won the first two legs and another favorite won leg three. Our fourth-leg choice, Village Benjamin, won, paying $8.20. We had three horses in that leg and along with the winner our other two (Devilish Donnie and Hey Scoob) completed the triple, worth $104.60. The Hambletonian Trail began on April 28 with a Dexter Cup elim at Freehold. For the results of that and to read the results of all the stakes we follow leading to the August classic, go to the Hambletonian Society site. The “Trail” blog features wagering suggestions for the stakes, race previews and event news, in league with the society and TwinSpires. As of April 29, Harrah’s Chester becomes Harrah’s Philadelphia. The marketing move changes the reference to the Pennsylvania track in past performances (PPs) from “Chst” to “Phl.” All races in PPs prior to April 29 will remain Chst. At Cal-Expo, the Friday-and-Saturday late Pick 4s’ guarantees increase to a $20,000 gross pool. With the exception of the TwinSpires no-takeout Pick 4 on Friday, which we always cover here, the Pick 4s’ takeout is 15 percent. Vernon Downs opened with a bang on April 27. The New York track and its sister venue, Tioga Downs, will contribute greatly to the Trail this year, including May’s Excelsior Series for soph filly-and-colt trotters beginning May 18 and a number of New York Sires Stakes for those divisions. The Raceway at The Western Fair District will be the host again for the $300,000 Molson Pace. The race for older pacers highlights the closing night program on Friday, May 25. This year’s event has a special post time of 6:50 p.m. The Pick 4 will offer a guaranteed pool of $15,000. The Pick 5 will feature a guarantee yet to be determined that night as well. Both wagers offer a 15-percent takeout. Defending champion Foiled Again headlines the list of this year’s nominees, which also include We Will See, Betterthancheddar, Up The Credit, Aracache Hanover, Atochia and Strand Hanover.